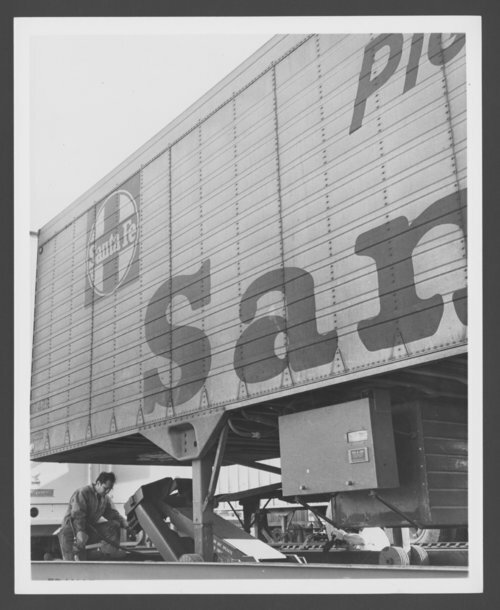 This black and white photograph shows an employee from the Atchison, Topeka & Santa Fe Railway Company securing a piggy back trailer at a unidentified location. In the railroad industry the trailer travels on flat cars, (TOFC), commonly referred to as a piggy-back service. This intermodal form of transportation, between the railroad and trucking services, allows for freight to be delivered in half the time.